We would like to thank everyone for attending our Poila Baisakh + General Body Meeting event! We'd also like to thank the Dakshini well wishers for their endless support who could not attend due to other priorities. An important factor for the event's success was the awesomeness of our Food Commitee...special sincere thanks them! The event began with the outgoing president's words of wisdom which lead to the official handover of office to the new Executive Committee. 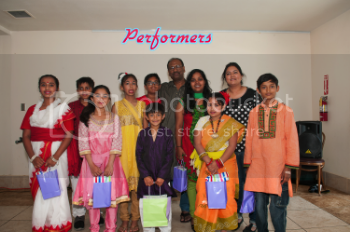 Following the handover, a few of the community kids gave some wonderful performances in appreciation of their roots. There was a break with cha, ghugni, and shingara which everyone enjoyed to the fullest. Then the Food Committee was honored by the new EC for their beyond praise worthy culinary service to Dakshini these past years. 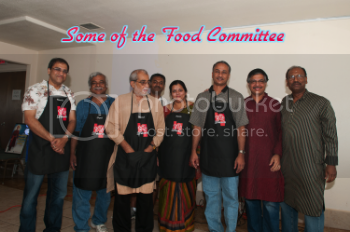 Each member of the food committee was gifted personalized Dakshini aprons with their names on it. The winners of the spring P.C. Chandra lucky draw were also announced. 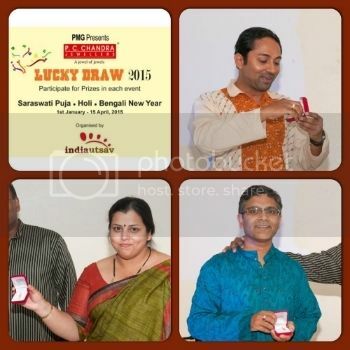 Koushik Chattopadhyay, Riddhi Chakraborty, and Ranjeet Ganguli each received a gold pendant all the way from India! Our next lucky draw will be hosted by Senco Gold & Diamonds. Three winners will be announced at our Srabon Sandhya event on July 19th. They will each receive a diamond pendant! CLICK HERE TO REGISTER FOR THE SENCO LUCKY DRAW! Do it now! Following this, the general body meeting commenced with important topics regarding Dakshini. We covered financial updates, the year plan, NGOs, Children's AACE program, etc. The afternoon ended in the evening with a "dhoom dhaam" Bong feast of luchi, aloo'r dum, cholar daal, malpua, and bonde! Everyone was stuffed, but the kids still had room for ice cream Coke floats. NEXT 2 EVENTS: Super Saturday Picnic (June 20th) and Srabon Sandhya (July 19th). Stay tuned for details!